Forward Neymar is to sue former club Barcelona over a 26m euros (£23.97m) unpaid loyalty bonus included in the contract he signed last November. It comes after Barcelona said they were suing the new Paris St-Germain player for 8.5m euros (£7.83m), as they want him to return the bonus paid when he signed the five-year extension. Fifa said it had received a claim from the Brazilian against Barcelona. On Tuesday, Neymar announced he will contest the Catalan club's lawsuit. 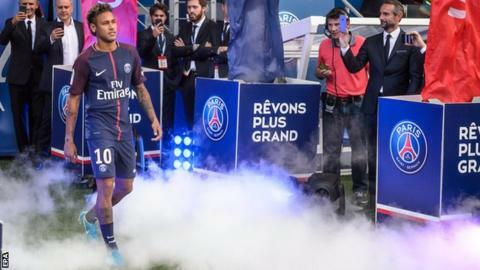 PSG broke the world transfer record earlier this month by triggering the 222m euros (£200m) buyout clause in Neymar's contract. The 25-year-old won two La Liga titles, three Copas del Rey and the 2015 Champions League during his four years with Barcelona. Meanwhile, Barcelona defender Gerard Pique believes forward Lionel Messi will not leave the club despite delaying signing a new contract. The five-time world player of the year and Barca's all-time leading goalscorer agreed a new four-year deal on 5 July, but has not yet put pen to paper. Messi, like Neymar previously, has a release clause set at 250m euros (£230m). The 30-year-old could even agree to leave the club for free as early as January, as his current contract expires in June of next year. Pique said he is unconcerned by the delay. "Everyone has the right to sign when they want, and we hope he signs it as soon as possible but I'm not worried at all about his contract, because I know him and I know what he's like," said the Spain international.